Ryū ga Gotoku Kenzan! (Japanese: 龍が如く 見参！, "Like a Dragon Arrives! 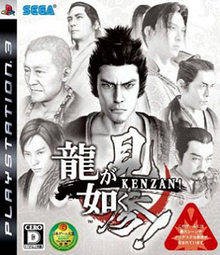 "), unofficially known as Yakuza Kenzan, is a jidaigeki-themed spin-off game in the Yakuza series. The game was developed and published by Sega for PlayStation 3. It was unveiled at the Tokyo Game Show 2007 and released in 2008. A second Yakuza series spin-off set in samurai era, Ryū ga Gotoku Ishin!, was released in 2014 on both the PlayStation 3 and the PlayStation 4 systems. Ishin! is set two centuries later than Kenzan!, hence the plots are not related to each other since both games focus on different characters, the historical figures of Sakamoto Ryōma (1836-1867) and Miyamoto Musashi (1584-1645) respectively. The gameplay shows minimal evolution from the first two episodes except for the new item storage system which allows access to an unlimited number of items from savepoints. However the graphical engine's improvement is obvious during the numerous real-time 3D cutscenes. There are four fighting styles in the game; fists, one blade, two blades and two-handed blades. There are also QTE-based special moves that the player can execute, known as 'heat action'. This spin-off is set in Kyoto during the Edo period, in 1605. It is an account of the life of Miyamoto Musashi. The main adventure is completed with sidestories including minigames and a hundred "sub-stories". 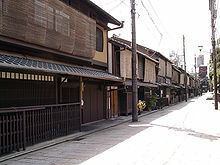 After being defeated by the Tokugawa clan at the historical Battle of Sekigahara which took place on October 20, 1600, Miyamoto Musashi retired from his great swordsman life to become a modest yojimbo (bodyguard) in Gion (祇園), Kyoto. Five years after the battle, a little girl named Haruka comes to Gion seeking a local hitman known as Kazumanosuke Kiryu which is actually Miyamoto's new identity. After eventually finding Kiryū, Haruka asks for him to assassinate an impostor pretending to be Miyamoto Musashi. At first, Kiryu refuses, then when the girl goes as far as becoming an indentured servant in an opulent oiran brothel in order to pay the assassination mission he accepts the one-ryō request. This is the first game in the series where the games's main characters have their face modeled in 3D after their voice actors who are Japanese celebrities. Cyberware's color 3D scanner (model PS) was used to analyze each actor's head & face in order to collect data on its shape and appearance, then this file was worked with the Softimage XSI 3D graphics application. Two playable demos were released on January 7, 2008 via the Japanese PlayStation Store. The first demo included sandbox play, and the second had a collection of various combat and romantic gameplay segments. As part of the pre-ordering campaign, the Japanese first print was bundled with a limited item, a monography called Kamutai Magazine (March 2008 issue). Sony celebrated the Japanese release of the game with a 10,000 pieces limited edition Satin Silver 40GB model "PlayStation 3 Like a Dragon Kenzan! Pack" (龍が如く 見参！パック, ryu ga gotoku kenzan! pakku) SKU including a "Rising Dragon" (昇竜, noburyu) stickers set to customize the console case. The Japanese version was released on March 6, 2008 in both Japan and South East Asia, while Sony published it in South Korea on March 25, 2008 with a subtitled script book. In late December 2009, commenting the opportunity of a western release, Sega Australia managing director Darren Macbeth said "there is nothing in the plan at this stage for Yakuza Kenzan. Right now we are focusing on the release of Yakuza 3. The feedback we get from this release will help us in making future decisions". In March 2010, Yakuza 3 had a western release as did in 2011 Yakuza 4. Then again, in 2012, a second spinoff was also released abroad and localized as Yakuza: Dead Souls. The Ryu Ga Gotoku Kenzan! Original Sound Track (HCV-381) album was published by Wave Master in Japan on March 6, 2008. Music was composed by Hidenori Shoji, Hideki Sakamoto, Hiroyoshi Kato, Keisuke Ito and Yuri Fukuda. This OST is noticeable for an exotic track, a flamenco piece titled Baile con la mariposa (Spanish for "Dance with the Butterfly") which is the theme for the duel between Musashi Miyamoto and Itto Ittosai. The track list has 31 titles (details are available below). Additional soundtrack includes two songs by Japanese hip hop artists Zeebra and Ketsumeishi ; Zeebra collaborated later with the Yakuza 4 opening theme, Butterfly City. opening theme: Bushido by Zeebra. Released in Japan by Pony Canyon (PCCA-02642) as a dual-disc single on March 5, 2008. First disc is a CD including the title track and an instrumental version plus a B-side Lyrical Gunman (Three Gunz Up Remix) featuring Rudebwoy Face and Chappa Ranks. Second disc is a bonus DVD with the music video for Bushido which includes cutscene footages from the game. closing theme: Life is Beautiful (ライフイズビューティフル, raifu izu byutifuru) by Ketsumeishi from their 2007 album Ketsupolis 5 published in Japan by Toy's Factory. Marume Nagayoshi versus Miyamoto Musashi (a.k.a. Kazumanosuke Kiryu) in Event Mode. Clothes manufacturer Cropped Heads collaborated with Sega to produce licensed Ryu Ga Gotoku Kenzan! tee-shirts, and Ace Cook produced Ryu Ga Gotoku Kenzan! cup noodles. As of July 9, 2008, the game has sold 270,438 copies in Japan, according to Famitsu. As a best seller in Japan, the game received a budget re-release under the PlayStation 3 the Best bargain collection on December 11, 2008. It earned the Award for Excellence at the Japan Game Awards 2008, and the Japanese video game magazine Famitsu reviewed it 37/40. ^ a b Laura Parker (2009-12-28). "Nagoshi talks Yakuza 3". GameSpot AU. Retrieved 2010-01-01. ^ PlayStation.com(Japan) Software Catalog - Ryu ga Gotoku Kenzan! ^ Reported by 福田柵太郎 Photo by 佐伯憲司 (2007-12-04). "セガ、PS3「龍が如く 見参!」完成披露会を開催発売日が2008年3月6日に決定". Game Watch. Retrieved 2009-12-30. ^ Hewlett-Packard Japan (2009). "HP Workstation 導入事例紹介株式会社セガ 「龍が如く3」". Hewlett-Packard. Retrieved 2010-01-17. ^ "『龍が如く 見参！』と新色サテン・シルバーのプレイステーション3本体を同梱した特別パックが発売". Famitsu website. 2008-02-05. Retrieved 2009-12-29. ^ "Ｔシャツ : CROPPEDHEADS セガ コラボTee「龍が如く見参」　復刻版 : クロップドヘッズ". Repair Co. 2008. Archived from the original on July 6, 2009. Retrieved 2009-12-29. ^ "焼きうどん「龍が如く」見参！". IT Media. 2008-01-17. Retrieved 2009-12-29. ^ "Sony PS3 Japanese Ranking". Japan Game Charts. 2008-07-25. Retrieved 2008-08-03. ^ "Japan Game Awards 2008 – Games of the Year Division". CESA. 2008. Retrieved 2009-12-31. This page was last edited on 7 March 2019, at 23:49 (UTC).